Valve is all about fan service. And with "over 125 million active users" in its Steam base, that's a lot of varying expectations to meet. This month, the secretive Bellevue, Washington-based video game developer (Portal, Half-Life) is about to finally bring to market a suite of its Steam Machines, a console-like living room solution for its PC-gaming base. The hardware rollout's been a long time coming for Valve -- the original Steam Machine announcement was made back in September 2013 -- but at least one aspect of it has been very public: the evolution of the Steam Controller. And its design is about to, quite literally, be put in the hands of consumers. "Anytime we've let the community get involved in the construction, the creation, the modification of things we've created, it always worked out fantastically," says Valve designer Robin Walker, speaking at the company's headquarters. "It was always better. It would be utterly bizarre if, for some reason, that wasn't the case for hardware." Two years ago, when Valve first unveiled its preliminary design for the Steam Controller, the company arranged for a limited beta, giving out 300 prototype units to the lucky chosen few of its Steam user base. While feedback from that beta no doubt informed the many iterations Valve ushered out over the past couple of years, much of its original vision has been left out of the final design. 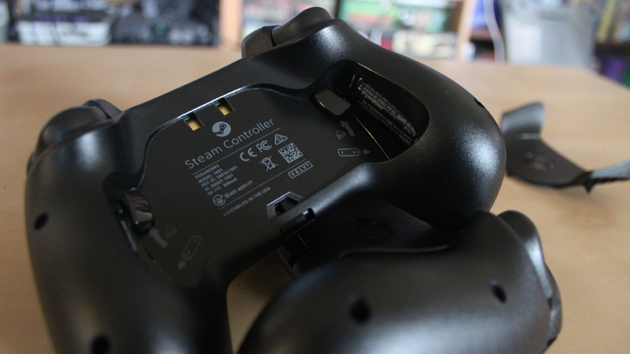 The current retail version of the Steam Controller includes two clickable trackpads (one with an integrated d-pad "to support backwards compatibility" with the Steam catalogue and one for high-precision aiming); standard A, B, X, Y buttons; left and right shoulder buttons and triggers; two clickable pads on the back; and a left thumbstick. Valve's ideal, however, would look a bit different. Namely, it'd lose the left thumbstick, something it's included as a legacy feature. Adds Walker: "The [inclusion of the] thumbstick was another one where a lot of this is about transition and so when people sat down and had no thumbstick ... that transition was harder. ... We hear from people that've used [the controller] a bunch. A lot of times they often hit the point where they say they just prefer to use the pads all the time." "Anytime we've let the community get involved in the construction, the modification of things we've created, it always worked out fantastically"
Valve would also like to bring back the clickable, high-resolution touchscreen introduced in the first prototype. "Active screens on the controller -- we think, probably long-term -- will be something that'll be interesting," says Valve designer Erik Johnson of future Steam Controller iterations. Although, that said, both Johnson and Walker acknowledged the difficulties in directing a player's attention to and away from that controller-mounted screen. The good news is that Steam users that aren't quite pleased with Valve's final controller design won't have to grin and bear it when it's released this month. The company's aware that there's no one form factor ideally suited to the hands of its massive Steam base and so it's looking to crowdsource the design and even provide the components. "We want to empower the community to get to the point where the community starts doing these things," says Johnson. "So things like creating a workshop for the form factor ... we'll provide all of the CAD files, so if you wanna get in there and start messing with things. Long term, I think we'd like to sell you all of the electronics inside as a separate thing if you wanna do that because you wanna go and build a completely different-looking one, but you don't wanna have to worry about the electronics." It's an ambitious initiative, no doubt, which is why Valve aims to take it slowly, dealing with the reception of its first batch of Steam Machines and controller before delving into a community-focused hardware push sometime next year. "We have kind of an unusual approach to how our manufacturing with this works, and it's mainly around flexibility," says Johnson. "So if we decide that ... the controller is going to evolve in some direction, it's pretty straightforward for us to change the way that we're building them."